If high-cost heating and electric bills are making this winter unbearable for you this winter, perhaps it’s time to consider clean, renewable energy options. 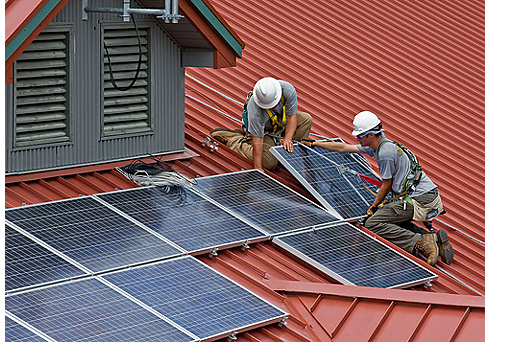 It’s a perfect time, since generous state and federal tax credits, rebates, grants, and loan programs are available for those who install solar energy systems, small wind systems, geothermal heat pumps, and residential fuel cell and microturbine systems. These systems significantly reduce your fuel and electricity bills, as well as the amount of air pollution and greenhouse gases that result from your use of fossil fuels (oil, propane and natural gas), or from generating electricity. (Half of the electricity generated in the USA is by burning dirty coal). Geothermal heat pump systems, or ground-source or water-source heat pumps, use the constant temperature of the earth as the exchange medium instead of the outside air temperature like conventional air-source heat systems. A geothermal heat pump system is highly efficient, quiet, long-lasting, and requires little maintenance. Eligible solar energy systems include solar water heating and solar electric (photovoltaic) systems. Solar water heating, or solar thermal systems, can be used in any climate and should drop your water heating bills by 50%–80%! Photovoltaics use solar cells that capture heat from the sun and convert it directly into electricity. Small wind systems collect kinetic energy from the wind and convert it to electricity that is compatible with a home’s electrical system. Small wind systems are one of the most cost-effective home-based renewable energy systems, lowering electricity bills by 50-90%! Check out my previous post featuring several types of wind turbines. Residential fuel cell and microturbine systems use hydrogen and oxygen to cleanly and efficiently create electricity — producing water and heat as by-products. Learn more here. For additional incentives in your State, visit the Database of State Incentives for Renewable Energy and Energy Efficiency (DSIRE). The British Government announced its Renewable Incentive scheme today which, when it launches in April 2011, will pay homeowners with air source or ground source heating systems circa £900 a year for generating heat from renewable sources. its part of a £30bn bdget to promote domestic sustainability, and we think it will make a big a big difference to the many thinking about switching from oil or gas heating systems.